The gallery on the Galaxy Note Pro 12.2 can be sorted into albums, all photos and videos, time, location, people and favorites. You can pinch to zoom in the gallery and thus manage the size of the thumbnails (four or five on a row). Air view works in the gallery as well. You can hover your finger above an image and you'll get a bigger thumbnail preview of the image or you can use it to peek inside folders. Upon choosing an album (for instance Camera) you're taken into that album's stack of photos but a swipe to the right will reveal a bar with all the albums. This means you can change albums without going through the gallery homescreen every time. Upon a press and hold on a picture, you'll be able to select multiple images, which you can then mass delete, share, copy or move. The single photo view has several shortcuts for sharing (via an app or over DLNA) and a delete button. At the bottom is a line of small thumbnails of all other photos in the album. You can tap those small thumbnails to move to other images or you can just swipe to the side. You can easily retouch photos right in the Gallery itself. The photo editor gives you options like crop, rotate, color and effects, plus a few fun options like stickers and custom frames. You can also make a memo on top of the picture. There are a couple of ways to create a handwritten note for each photo. One creates a Polaroid-like frame and lets you scribble the note (this is easy to share) or to write a note and store it separately (harder to share, but nondestructive). Another cool feature is Buddy photo share - it recognizes faces in a photo, you link those to your contacts and the tablet will learn to recognize them itself. Then the faces in the photo become handy shortcuts to that contact. The Gallery also supports highly customizable slideshows. The My Files app organizes your files into categories - Images, Videos, Music, Documents, Downloaded apps, Recent files and even Dropbox files. Those categories are always visible at the top of the screen, while the bottom part is split between folders and their content (with a complete tree view, similar to Windows Explorer). The My Files app can move, copy, lock and rename files in bulk, even send multiple files to another phone. My files will browse the memory card and the large internal storage (it can't access the system drive). More advanced functions include handling ZIP files and connecting to FTP servers. The TouchWiz music player on the Galaxy Pro 12.2 is jam-packed with features and supports a wide variety of file formats, including FLAC. The player uses the same split-screen interface as most other apps. Music is sorted by the usual Artist, Album and Playlist, Folders and DLNA devices. There's also the Music square - the Note Pro 12.2 scans your music library rating each track in terms of tempo (Exciting or Calm) and emotion (Passionate or Joyful) and will load a playlist matching your chosen tempo and mood. The emotion axis in the graph can be switched to Age, which makes it easy to automatically create a playlist of classics or new tracks. The Now playing screen gives you the usual options: a timescroll, playback controls, an AllShare shortcut. A coverflow-like list of album art lets you know what the next song will be and is an easy way to skip to it. The music player will also try to find the lyrics for the song you're listening to. Samsung has enabled several audio-enhancement features. The equalizer presets are cleverly organized into a square similar to the Music Square. The presets balance between Treble and Bass, Vocals and Instrumental. You can also just tap the Auto toggle and enable a Tube amp effect, 7.1 channel virtualization, along with Studio, Club and Concert Hall effects. The advanced view of the equalizer gives you a proper seven band equalizer you can tune manually and enable additional effects like 3D, Bass and Clarity. The list of audio features doesn't end here. Smart sound will keep the sound level consistent between tracks, while Adapt sound tests the performance of your headphones and tunes the equalizer based on that. 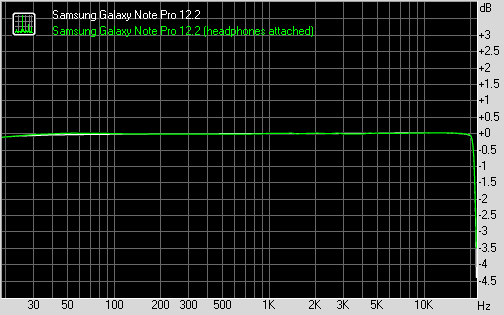 While our Galaxy Note Pro 12.2 doesn't have telephony features, we still tested the loudspeaker performance as it will be used for music and videos. It scored a Good score and we can confirm the stereo speakers are indeed fairly loud. It helps that the speakers are one each on the sides of the wide tablet, which enhances the stereo effect. The new video player found on the Samsung Galaxy Note Pro 12.2 makes use of the Multi-window feature. When you play a video (in the video app or even in the file browser), the app gets the left half of the screen, while the video is played on the right side (and you can adjust the split). This is pretty neat, especially if you're just clicking through videos, wondering what to watch). Switching to fullscreen is as easy as dragging the separating dot to the edge of the screen. Pop Up play is also enabled if you want the video to play in a small, floating window. Anyway, the video player interface has three tabs - Personal, Downloads and Nearby devices - complete with a search field. The available videos are shown as a grid of animated thumbnails, but list and folder view are also available. If subtitles are available, the video player will automatically find and load them. You can also manually load subtitles if the video and subtitle file names don't match. You can change the zoom mode (100%, fit to screen with and without affecting the videos aspect ratio) and there's a pinch zoom too, in case you want to get close to a specific part of the action. Codec support is pretty dismal, however. Most videos we tried resulted in an "audio codec not supported" message and even some basic video codecs don't work (i.e. DivX). MKV, AVI (XviD) and MP4 videos do play, but anything beyond MP3 or AAC sound is no go. 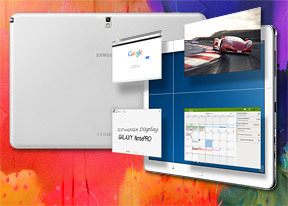 We should note that we used the Wi-Fi only version of the Samsung Galaxy Note Pro 12.2, which is based on Samsung's Exynos chipset. The Snapdragon-powered LTE version might do better in this test. The same SoundAlive audio-enhancing technology from the music player is available here too. There are additional settings for the brightness, playback speed and feeding the audio through Bluetooth (if you have wireless speakers). Pop Up Play was Samsung's first foray into floating apps and is still available. You can move and resize the video window so it doesn't get in the way of other apps. The Samsung Galaxy Note Pro 12.2 matched the performance of the Galaxy Note 10.1 2014 Edition in our audio quality test. It showed amazingly clean output in the first trial and even though it was about average in terms of loudness the overall impression is excellent. The huge slate wasn't particularly bothered when we plugged in a pair of headphones either and put in another great performance. The solitary affected reading was stereo crosstalk and even that remained great.